Stephen Elop seems relaxed for someone so busy. The Nokia CEO breezes into our meeting room away from the hubbub of the CES 2012 show floor and immediately starts to talk about the launch of the new Lumia 900 the previous day. The Canadian is in Las Vegas for two days before jetting off to Helskini. Then he's in China the day after that. "I travel all the time," he chuckles. Despite his lofty status at Nokia, he's quite personable - recommending TechRadar the red Finnish sweets from the bowl - and seems happy to be candid. However, Nokia is in its 'quiet period' ahead of its quarterly and 2011 annual results next week, so he is limited in some regards, although this doesn't stilt our chat. The results aren't expected to be pretty, but the former Microsoft Office boss seems relieved to be talking about new Windows Phone handsets rather than the receding shadow of Symbian (although we asked him about that). The only time he prickles is when he is asked about the continuing rumours that Nokia will be taken over by Microsoft. "The rumours are baseless and it seems certain factions who like to generate rumours are running out of fresh material and [are] recycling the old." He's more relaxed yet still forceful about how Nokia is avoiding the spec race that many smartphone manufacturers have been sucked into - the Lumia 900, 800 and 710 all have single-core Qualcomm Snapdragon processors. "You don't need a quad-core phone unless you want to keep your hands warm in your pocket. It's a constant dilemma in technology. There will also be some company or product where whatever the spec item is, they will have n times two of whatever and the other products only have n. There will always be that. "We're believers in the experience so, fine you have this camera density and you have that camera density. Let's put the pictures side-by-side and we'll show which ones are better." Elop is crystal clear on the point that the company had to move away from Symbian for its higher-end devices, and he believes Nokia has made a great choice. "We selected an alternative platform because we were enduring a significant decline in Symbian. "We were hearing from consumers that it had some pretty fundamental competitive challenges that there was [no way to solve]. We could see what was happening; reports of market share decline, in the United States and also in Great Britain and so on. So we took action based on that." He also believes that there's still plenty of opportunity for Nokia to be different to other vendors with the Windows Phone platform. "There are no limits to our ability to innovate and differentiate because we have selected Windows Phone. No limits whatsoever. We have people building software, services, hardware. "In terms of our R&D, the dollars that we spend are far more focused on those things where we can differentiate, where the innovation is truly meaningful. We're spending far less money now on the underlying plumbing that people don't see... we've reduced our costs by partnering with Microsoft. "My belief is that the effectiveness of that innovation, because we're focused on those things that really set us apart, will be higher than they were before, because so much of our investment before had to go into the underlying elements of sustaining a platform." Asked about the breadth of devices Nokia intends to launch with Windows Phone, Elop is clear that the company will be looking to introduce plenty more lower-end Windows Phones such as the Lumia 710. "It's very hard to define what's a smartphone today. You can say it's down to a certain price point or a certain chipset, but the smartphone range of products over time we intend to tackle with Windows Phone means that upwards as well as downwards in the price continuum you can expect a full range of Windows Phone products. "The 710 is a step in the downward direction, but there are more steps to take and we are taking those steps. We're not being specific in the timing of that, but there is engineering work underway, to move down, and there may be opportunities to move up in terms of enhanced functionality and special features." Elop also seems set to develop Nokia's position in the low-priced market. "There are people in the world who are less willing or unable to spend a certain amount on a device. Clearly we're going to have to serve them in a different way. "Today we serve that need with our Series 40 products, we've indicated as part of our strategy that we have increased the research and development spending in that area. We have new programmes underway that we haven't announced, for whatever is below the smartphone range, whatever is below Windows Phone. That's news that's ahead." Asked about tablets, Elop reiterates that Nokia has "not made any announcement", but he's keen to talk up the Metro user experience, saying it's clear the live tiles are "a bet they're placing broadly." "We see that as a very positive development, because the amount of visibility that this [picks up Lumia 900] user experience is going to get is not just limited to [phones], but covers PCs and tablets around the world. That's all good news. "We see some opportunities there. I want to make sure that whatever other footprint area we play in, we can differentiate there as well. There's going to be a lot of Windows 8 tablets and PCs - can we be different, can we do something, and if so that would be interesting." 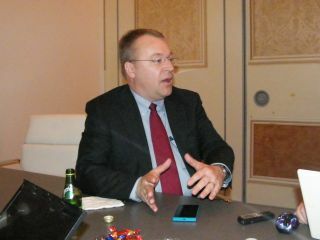 Moving onto talk about the company's new Nokia Lumia 900 LTE handset, Elop says the company's overall message at CES has been about the re-entry strategy into the United States. "In the US the big basis of competition these days is about the network, the speed of the network... so the Nokia 900 is the first LTE device that Nokia has ever shipped or ever designed. "We're very pleased with the reception, a lot of people are beginning to look at the device and in the immediate months ahead we'll be saying more about specific dates and pricing." Will there be CDMA devices? "We haven't announced CDMA devices with Verizon or Sprint, but we have said publicly that there will be CDMA devices coming... yes, in 2012." We ask if LTE poses particular challenges for Nokia. "There are some things that everybody is learning and doing a better job on each time. For example, LTE uses a bit of power. And so yes, we have an 1830mAh battery in this device, partially to address that, but we've also done a bunch of refinement work with LTE to improve our battery life on that network." Nokia is targeting decent growth in the US, but Elop is cagey when it comes to being more specific. "We're not saying 'here's the target'. The more important thing is to see the momentum building, to see the growth happen. The US is where Nokia has the lowest market share, we're starting from virtually a standing start. "In terms of attracting consumers, the Nokia brand has a lot of equity, since it relates to products that people remember that have been remarkably reliable, durable and trustworthy that stand for brilliant design. "But then there are many people who haven't had a Nokia experience, so we have a bit of a dual challenge. There are 150 million people in the US who have not had a smartphone yet. Those people are a great opportunity."